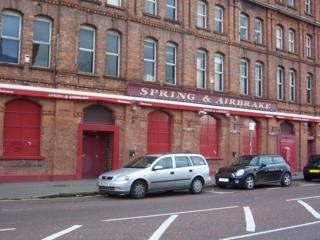 The newest addition to Belfasts music scene. The Spring&Airbrake is rapidly establishing itself as a first rate venue.Boasting a top of the range PA, the Spring&Airbrake has already seen acts such as The Zutons,Athlete and Gomez as well as a monthly residency from renowned DJ David Holmes. In the short time since its opening, The Spring and Airbrake has acquired a enviable reputaion for hosting top quality bands that is only matched by the Limelights Hall of Fame. It is much sought after, because of its size and state of the art sound and lighting gear.As well as hosting up and coming acts, it has and will continue to feature well established artists. The likes of Goldie Lookin Chain, The Zutons, Gomez, Ash, James Blunt, Rodrigo y Gaberiela, Jerry Fish and the Mudbug Club, Kerbdog, Maria McKee,The Wedding Present, The Las have all played here. David Holmes has chosen the Spring to launch his New Left Bank events, which have presented Andy Weatherall and Two Loneswordsmen, Mui, Dalek, and Andy Votel to name but a few. The Famous Katy Dalys Alternative Pub Quiz, hosted by the inimitable Dave Neely, is held every Monday (bar the summer holidays.) Its not for the easily offended... in its history its had as guests Rick MacMurray (Ashs drummer, who dressed in a pink babygro and read the scores out at the end of each round, George Dawes stylee) Ladeeboys (NIs No 1 strip troupe) dancing on the bar, and a petition for the whole of the bar to go to the city hall and pelt Lisa Riley with Scampi Fries as she turned on the Christmas lights! On Tuesdays, Shag takes over and the venue is host to students dancing away to big party tunes. Have you got Google Earth on your computer? If so, then download the Google Earth view of Spring And Airbrake. Is this the wrong position for Spring And Airbrake? If you think so, then modify its position. Click / Tap the button above to get directions from where you are to Spring And Airbrake. Good night out at shag, once you get past the mad queue! Place was packed out with girls as young as 13 (seriously), could barely move!! Not that good. Alot of young ones getting in with just a glance at their ID. Had a great time in here! Have been a few times, and enjoyed it on all occasions. Unfortunately (but no doubt for good reason) we had to drink from those floppy plastic pint beakers as at the age of 28 i'm clearly not responsible enough to hold a glass.